Solve the quadratic equation obtained in any one of the above three methods. Relate the mathematical solution obtained to the statement asked in the question. If the difference between a number and its reciprocal is 24/5, find the number. Let "x" be the required number "1/x" be its reciprocal. Hence the required numbers are 5 and 1/5. A garden measuring 12m by 16m is to have a pedestrian pathway that is ‘w’ meters wide installed all the way around so that it increases the total area to 285 m2. What is the width of the pathway? 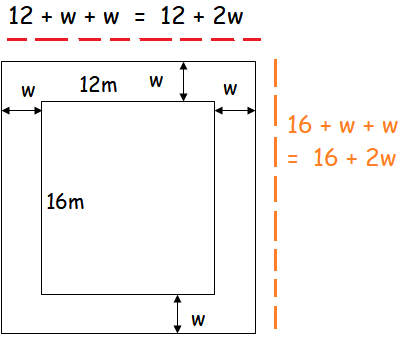 From the picture given above, length of the garden including pathway is 12 + 2w and width is 16 + 2w. Hence the required width is 1.5 m.
A bus covers a distance of 90 km at a uniform speed. Had the speed been 15 km/hour more it would have taken 30 minutes less for the journey. Find the original speed of the bus. Hence the original speed of the bus is 45 km per hour. After having gone through the stuff given above, we hope that the students would have understood, "Solving Word Problems Involving Quadratic Equations". Apart from the stuff given in this section "Solving Word Problems Involving Quadratic Equations", if you need any other stuff in math, please use our google custom search here.